In the Administrative Reforms Commission Report on Centre-State Relationship, M.C. Seetalvad states, "Constitutional edifice of India is neither unitary nor federal in the strict sense of term....and word 'federation' is nowhere used." It has been rightly stated in the memorandum presented to the Central Government by the West Bengal Cabinet on December 1, 1978: " The constitution though described as federal was essentially unitary in the character." In the early phase of the history of independent India; the Congress Party ruled at Centre as well as the states with the result that Centre's dominance prevailed. It is for this reason that all the communications in this book have been addressed to the officials of Central Government. Dr. Diljit Singh Pannun, the author of the book is a seasoned journalist with an analytical mind. 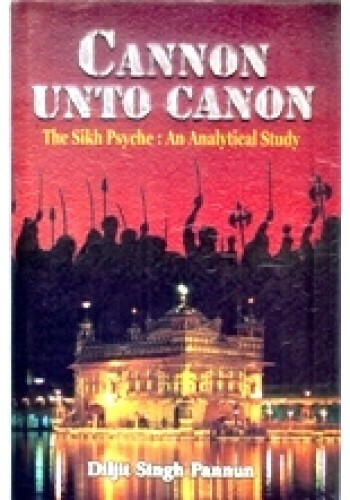 He has studied in detail the political crisis that afflicted Punjab during eighties of last century. He belongs to an illustrious family of Amritsar and his father has been the Chairman of Punjab Public Service Commission and enjoyed great reputation. The papers presented in this book do not intend to present a thesis. They are in the form of dispatches based on personal observations and oral evidence taken from the persons concerned belonging to different sections of society. Being a son of the soil, S, Diljit Singh Pannun has been in contact with masses and at the same time he developed contacts with senior bureaucrats. Among them he had a number of friends who did confide in him. Though he did not follow the formal method of Oral History viz framing questionnaire and use of tape recording etc., he had used in his own way the sources of Oral evidence which are so essential for recording the contemporary history. As a matter of fact this is a micro study of the Punjab crisis during eighties of last century wherein the minute details have been brought out. While commenting on situations he has not spared any individual howsoever well placed he or she might have been. He has criticised Darbara Singh the then Chief Minister of Punjab when he banned Sikh Students Federation, because, Mr. Pannun thought that it served no purpose. Rather it gave impetus to the agitation. Similarly he disagreed with Mrs. Indira Gandhi, the Prime Minister with regard to Operation Blue Star. He writes, "The remedy provided by Operation Blue Star to the maladies afflicting Punjab situation was not only misconceived but absolutely ill-implemented." 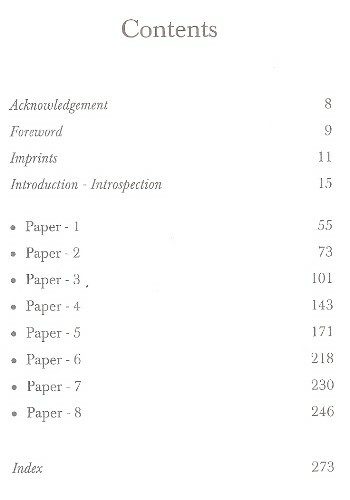 This important study contains eight papers. The first of these was addressed to the Cabinet Secretary, Mr. Diljit Singh Pannun asserts frankly, " There is nothing prophetic or it does not contain any Solomon like advice though it touches upon some of the suggestions that should be examined. My loyalty to the nation and country is supreme and it is nothing far extraordinary for an ordinary citizen to claim this." It is very significant to understand the main motive of preparing this incisive study in the form of papers. He wanted peace and prosperity in Punjab after bringing about cordial relations between the two major communities. 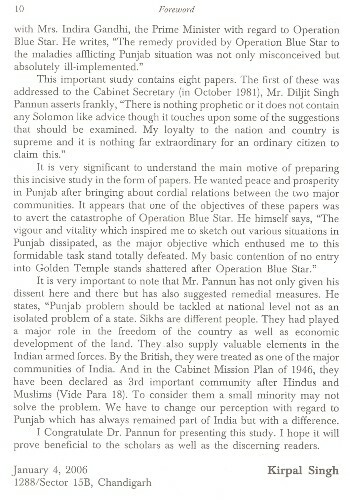 It appears that one of the objectives of these papers was to avert the catastrophe of Operation Blue Star. He himself says, "The vigour and vitality which inspired me to sketch out various situations in Punjab dissipated, as the major objective which enthused me to this formidable task stand totally defeated. My basic contention of no entry into Golden Temple stands shattered after Operation Blue Star." It is very important to note that Mr. Pannun has not only given his dissent here and there but has also suggested remedial measures. He states, " Punjab problem should be tackled at national level not as an isolated problem of a state. Sikhs are different people. They had played a major role in the freedom of the country as well as economic development of the land. They also supply valuable elements in the Indian armed forces. By the British, they were treated as one of the major communities of India. And in the Cabinet Mission Plan of 1946, they have been declared as 3rd important community after Hindus and Muslims (Vide Para 18). To consider them a small minority may not solve the problem. We have to change our perception with regard to Punjab which has always remained part of India but with a difference. I Congratulate Dr. Pannun for presenting this study. I hope it will prove beneficial to the scholars as well as the discerning readers. Diljit Singh Pannun(b.1938),M.A.,PhD. is the Indian Ambassador to Madagascar. He started his career as a journalist of repute. Later on he served also as visiting Professor in the Department of Journalism, Punjabi University, Patiala and Punjab Agriculture University, Ludhiana. He was a keen observer and analyst of Punjab events during the turbulent period and most of his observations were proved to be true prophecies. Hence, he is regarded as a genuine political thinker. Therefore his talents were utilized by the Indian Government at the highest level for International assignments. He always dreams of a Punjab shining in all respects. His role and achievement in several government and non-government organisations in the service of the weaker and backward sections of the society are highly outstanding and laudable. He is a true educationist to the core of his heart and is running some educational institutions, which are reputed centres of quality education. He expresses his concerns to every sensitive issue of the times and his opinion is always read and heard with respect. Cannon unto Canon is a collection of papers that Mr. Diljit Singh Pannun prepared as a political thinker to enable the political bosses and their bureaucratic assistants to have the feel of difficult situation prevailing in the Punjab during the first half of the decade of eighties of the last century, from the national perspective. The papers present an incisive analysis of the Sikh Psyche and Punjabi Hindus' response thereto. 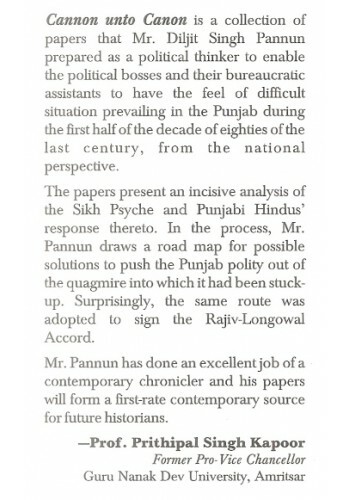 In the process, Mr. Pannun draws a road map for possible solutions to push the Punjab polity out of the quagmire into which it has been stuckup. Surprisingly, the same route was adopted to sign the Rajiv-Longowal Accord. Mr. Pannun has done an excellent job of a contemporary chronicler and his papers will form a first-rate contemporary source for future historians. Foreword To The Book 'Sikh Heritage In Paintings' By K. S. Bains Painting is perhaps the most.. 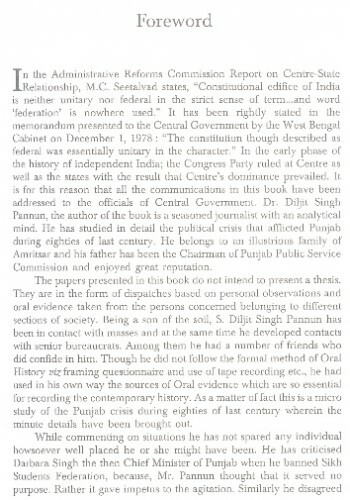 Preface Of The Book 'Co-Existence In Pluralistic Society - Punjab Issues And Prospects' By Madanj..